Over the last few days, I've found myself watching a load of videos on Mantis Burn Racing while playing it myself. Many of these videos were saying the same thing when watching them, that being that the game was decent and was well worth taking a look at. I also had my own initial thoughts on it too after playing the game for and hour or two, with the video for that found here. Not finding myself as excited about the game as these great people whose content I enjoy made me wonder if maybe I had just burnt myself out playing all the big games that we've seen recently. It could also have been that Mantis Burn Racing was just alright, and it wasn't this amazing racer that these people were making it out to be. 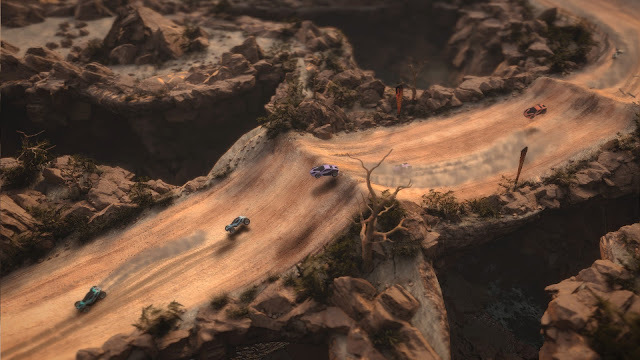 Mantis Burn Racing for those who don't know is a top-down racer that plays a little like games such as Micro Machines (I said a little like mind you). 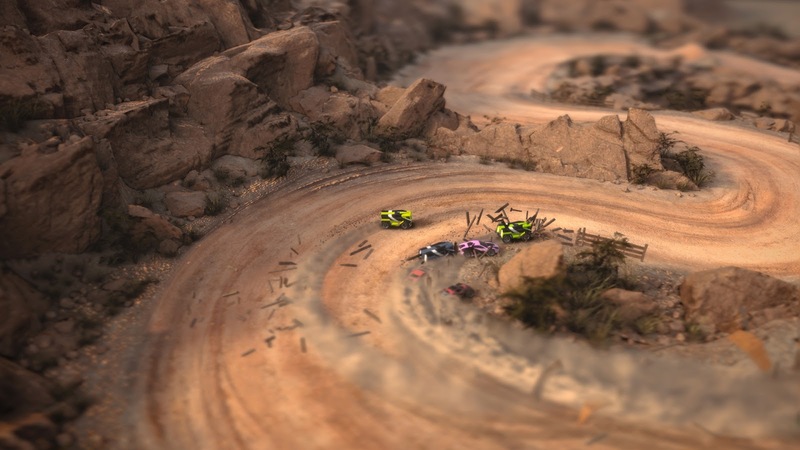 Mantis Burn Racing offers a career mode which promises 20+ hours of play, local play for those who enjoy racing people in the same room, and more surprisingly for a smaller release, an online section in which you can take you driving skills online with other players. Looking at the game from the off it seems a lot for a smaller release, which had me excited and looking forward to what it had it store for me. Sadly, the more I dug into the game it appeared to be all smoke and mirrors. Career is where we shall begin the review, as for me it looks to be where Voofoo Studios are expecting players to spend most of their time with the effort upon first glance. Scrolling through the mode when first loading up it looks a massive mode which promises a load of playability with numerous paths available in each of the seasons that are available. Gears are the currency that you will need to earn if you want to complete it all mind you, with these given to you for beating certain challenges in each event. While they may not be hard to get a hold of early on in the career, things do get a bit tougher, but you will need to get these Gears if you wish to complete the whole career. While the career is massive in size in regards to modes and paths, it's let down massively by the amount of tracks the game has available for it, with every event feeling very much like a "been there and done it" experience the more time you put in. I reached a stage of playing this mode where I just got bored in all honesty, as while it does mix things up in terms of the events available, driving around the same track be it reversed or not, things will and do get boring very quickly. Earning cash in these events will also allow you to unlock new vehicles along the way, with some of them also locked behind an XP rank too. These vehicles come in three sizes, with light, medium, and heavy being the three choices to choose from. Light means more speed, but heavies allow you to smash through things and use shortcuts on tracks to get around those tracks a different way. 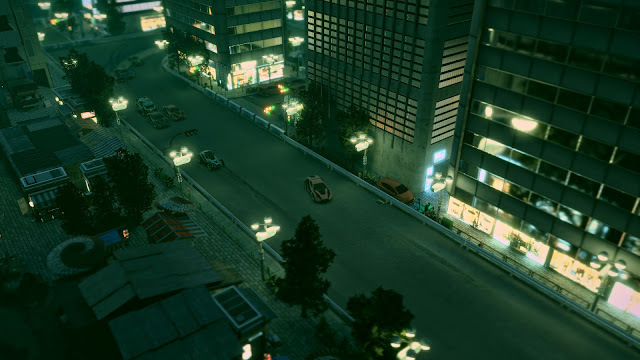 I can't deny that away from the lack of tracks that the driving aspect of the game is pretty solid, with a drift feel to the lighter cars, and heavy ones making it more about how well you can use your brakes on those tight corners. It just feels great racing around a track and nailing a perfect drift and overtaking a bunch of other cars, it's just sad that those corners soon start to feel like the last corner of the last track you raced on way too soon. Local play is a mode I never got around to trying out in truth, but I did get around to trying the online side a handful of times. I went in expect a bunch of lag what with it being a smaller release, but it played just fine, giving me the same experience as offline just with the taste of victory being that much sweeter knowing a human was in control of the other cars on the track. 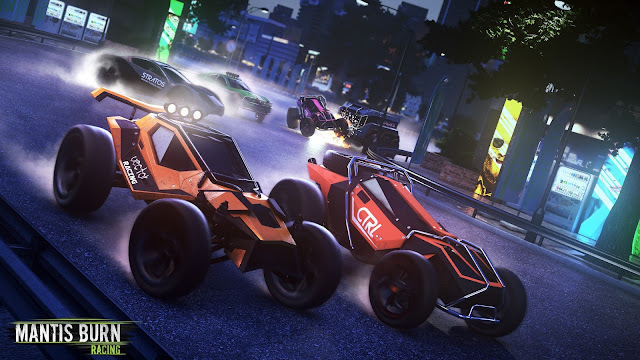 You can join a quick race or host a private lobby, with all the modes that feature elsewhere being here for you too. Once again (and I hate to sound like a stuck record here), the only thing stopping this being more fun is the limited areas that these races can take place in.